It’s no secret that I love vintage and thrift store shopping. 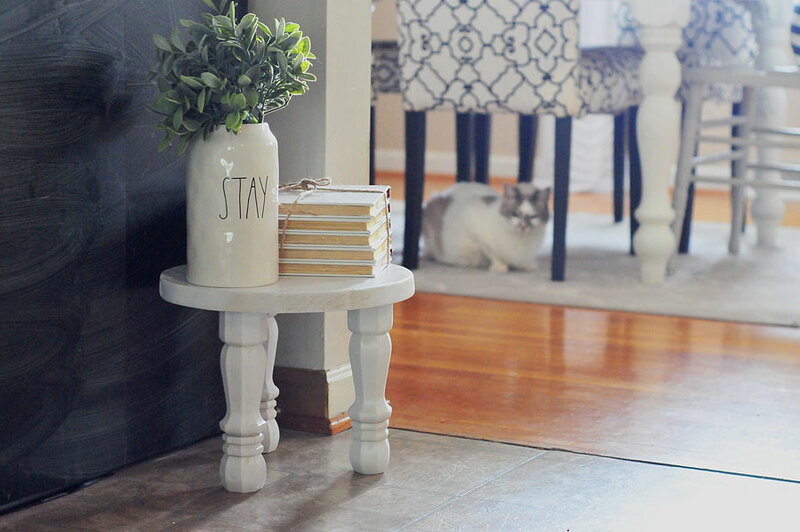 One of my favorite things to do is repurpose items that were used years and years ago. They possess charm and character that you simply can’t buy new. 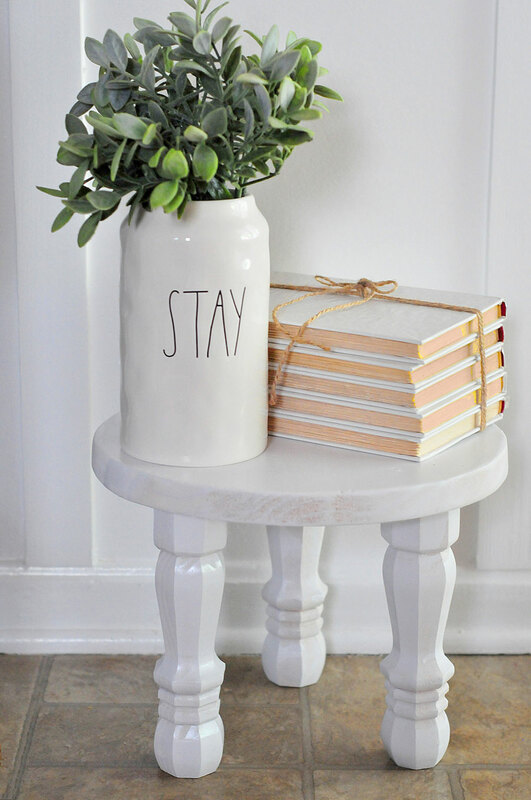 A few months ago, I was with my aunt shopping at Coach Light Antiques and a few other favorite local shops, and I stumbled on this white antiqued stepping stool. It was a three-legged one that was rough around the edges and stood about a foot off the ground. 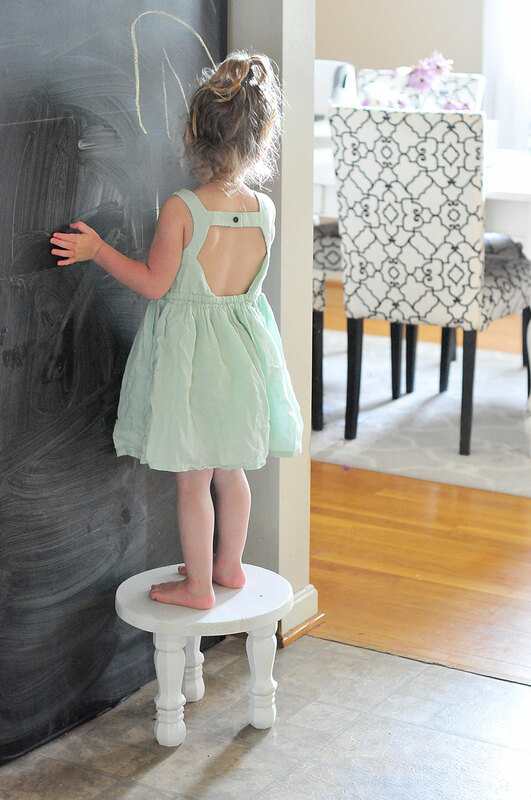 When I was a kid, I used to step up on a handpainted stool that my parents had, and I just love the idea of having something sweet like that for my daughter to use. Also, I’m relatively height challenged, so I’m generally in need of assistance for those higher cabinets in our house. Not even kidding. Of course, the stool I found at the antique shop cost a pretty penny, and me being me thought, “Oh, I can make that,” and then months later still hadn’t gotten around to it. I saw a pale green one at HomeGoods not too long ago, but even it was close to $40 which is far outside my I’m-willing-to-pay-that-much range. Plus, I would have had to paint that one. Well, friends, I’ve finally gotten around to making my own! And. I. Love. It. 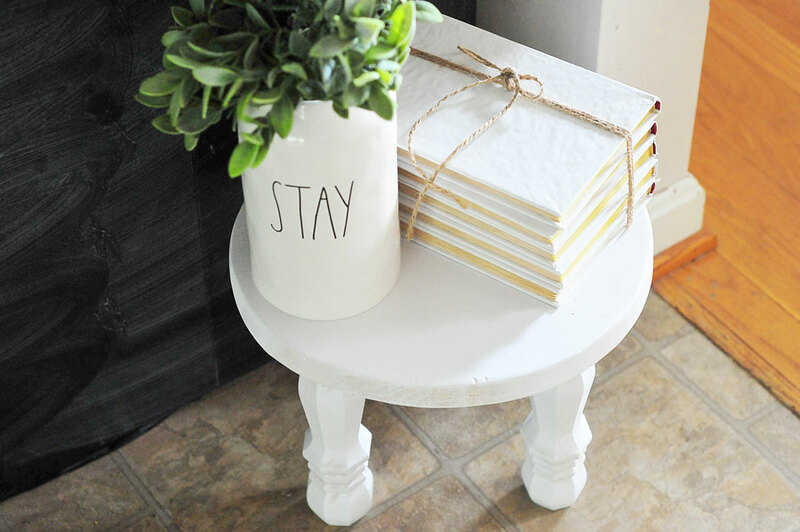 An old fashioned milk stool is what originally inspired me, and for mine, I really wanted some chunky, decorative legs and a white finish. So I set off to Home Depot. 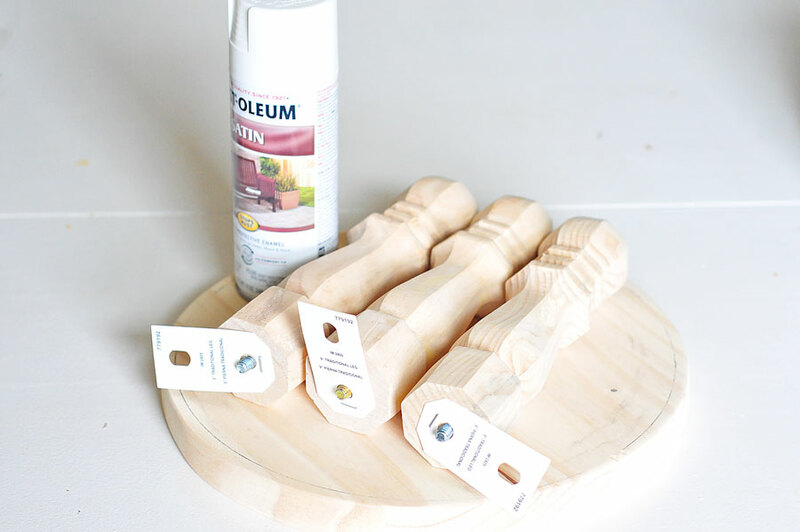 They have these legs available for a little over $3 each and these round pressed boards for around $5.50. That and some enamel paint is all I needed to make this project. We’re talking less than $15 total!!! The smallest round appearance board I could find was 17″, which was far too wide a diameter for this stool considering I used 6″ legs, so I broke out my trusty jigsaw and cut a 12″ diameter circle out of the appearance board. Then I sanded down the outside rim and rounded the edges a bit before painting. I know you’re shocked, but I actually didn’t distress this stool. I thought about it, believe me, and I still might go back and add some “scuff marks” (aka black dry brush paint), but for now I kind of like the solid white look, especially against the chalkboard in our kitchen. Before I talk about attaching the legs, let me walk you through my thought process on them. I originally wanted them to angle out. Unfortunately, the bolts that are built into these legs didn’t allow enough threading to do that. So I put them in straight, which is way easier but probably not as sturdy as I had originally intended. Against my husband’s advice, I only used three legs instead of four (we’ll see how this turns out in the long run). I will say that I can stand on this baby and she doesn’t move unless I get too close to the edge. So there’s that. All you need is a 5/16″ drill bit since the bolt screws are already built into the legs. I measured out equidistant points, drilled and screwed in the legs. That simple! Once everything was attached and solid, I clear coated the entire thing with a semi-gloss clear coat spray. That took a couple of hours to fully cure, and then it was ready to use! Y’all, this stool is super cute and my new favorite addition to our kitchen — not to mention it’s going to make a really cute photo prop! 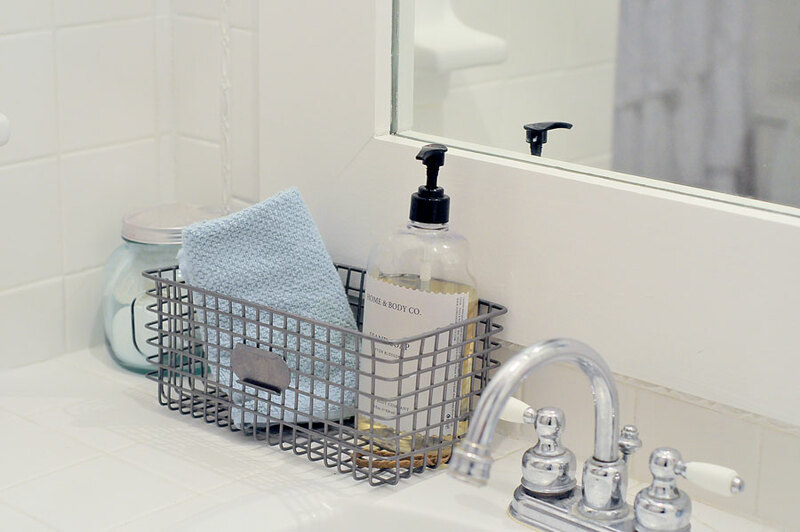 Now I feel like I need to make another one for our half bath… what do you think? I hope today is treating you all well! Thanks for stopping by! I need to make this for my house for P and S. Heck, who am I kidding? I need it too to reach things in the back of cabinets! haha Cute! Yes!!! It was so easy, too! 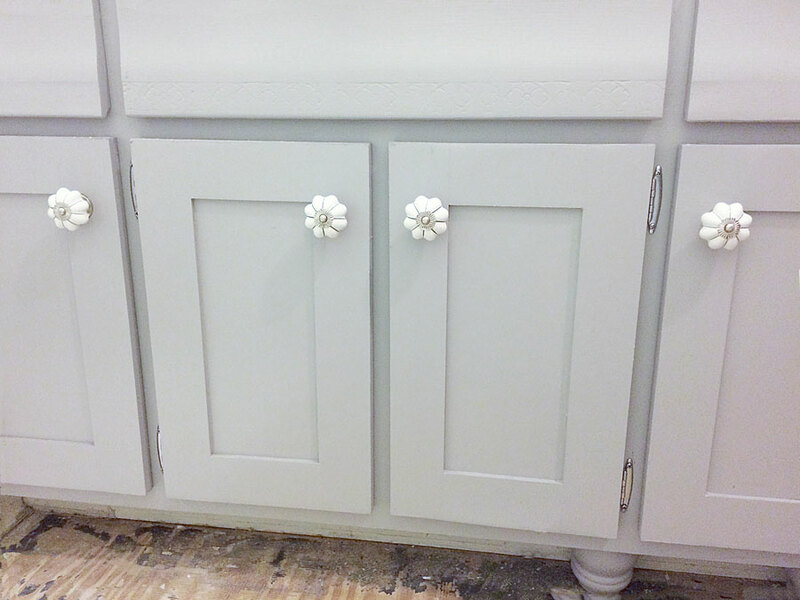 I totally use it — all the time, for cabinets, photo shoots so I can be taller… not even joking!